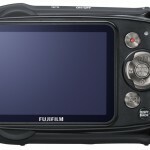 Fujifilm introduced three new FinePix XP rugged point-and-shoot cameras at CES / PMA this week. 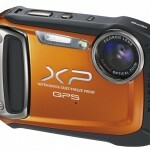 The new 14-megapixel, GPS-tracking FinePix XP150 is Fujifilm’s new top dog waterproof, shockproof pocket camera – perfect for vacations and outdoor sports like rafting, snowboarding and rock climbing. The XP150 replaces the XP30 as Fujifilm’s top-of-the-line rugged point-and-shoot, adding full HD video, improved GPS performance and doubling the waterproofing to 10 meters (33 feet). The XP150 has a 5x 28-140mm Fujinon lens with sensor shift Dual Image Stabilization, a 2.7-inch LCD display and it can capture up to 10 frames-per-second. If you don’t care about GPS in your camera, the new Fujifilm FinePix XP100 provides all the same features as the XP150, but without the built-in GPS. 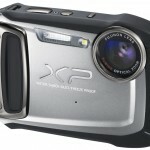 Many of the XP150’s basic specs – 14-megapixel resolution, 5x lens, LCD display – are the same as its predecessor, the XP30. The important updates are the improved waterproofing, upgrade from 720p to 1080p full HD video, and the improved GPS performance. 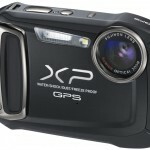 Same goes for the XP100, except for the GPS improvements, of course. For people who want a less expensive point-and-shoot camera that’s also built for abuse, check out our previous announcement for the new Fujifilm FinePix XP50. For a full overview of waterproof, rugged cameras, check out our Outdoor And Waterproof Camera Guide. The new Fujifilm Finepix XP150 will be available in black or orange and the XP100 will come in green, silver, blue, orange and black finishes. 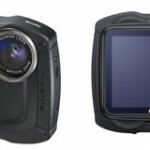 Both cameras are scheduled to be available in March of 2012. 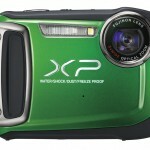 Projected pricing is $279.95 for the XP150 and $249.95 for the XP100.